Key members of Environmental Change-Makers are available to speak to your group. We make presentations on a wide range of topics related to building the new future. Joanne Poyourow is a co-founder of the Environmental Change-Makers, and is well-known in the regional and national Transition movement. (full bio) Joanne can speak on topics related to: The Transition movement; “Life after oil,” What We Can Do about peak oil and climate change; Starting Transition-type action in your local area; How the economy is changing and what your group can do; Starting a community garden; Vegetable crop rotation in Southern California; High-yield vegetable gardening within the urban footprint; many subtopics within organic vegetable gardening. Peter Rood is a co-founder of the Environmental Change-Makers. He is also an Episcopal priest, and pastor at Holy Nativity Parish. Peter’s gracious and generous vision of the church as a welcoming home to community-at-large has made many wonderful things possible at Holy Nativity Parish, including the Community Garden at Holy Nativity and the Environmental Change-Makers. (full bio) Peter can speak on topics related to: Church as welcoming community; Starting a community garden; “Inner transition” – the spiritual and psychological shifts we are making as we transform our outer, physical world. John Tikotsky is an ECM board member. He is the landscape architect who did the lion’s share of the design work when ECM was building the Emerson Avenue Community Garden. John is certified in water design and has taught at UCLA Extension and for the City of Santa Monica. John has led many of ECM’s hands-on workshops, including building rainwater harvesting infiltration pits, building with urbanite, making your own self-watering pots, and making your own metal plant tags. John can speak on topics related to: Attracting beneficial insects to your garden; Rainwater harvesting; Designing a community garden; Ecological garden design. Christine Budzowski is one of the key volunteers at the Community Garden at Holy Nativity. A Holy Nativity parishioner, she has seen the transformation of the church campus — from the days of scruffy lawn and dull junipers to the lively and abundant garden. She has also been part of the many other forms of food-centric actvisim and donation that the garden’s presence has inspired. If you are bringing your group to Westchester for a tour of our garden, Christine is one of our principal garden tour guides. 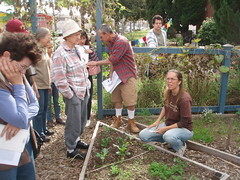 Christine can also speak on topics related to: Organizing volunteers for your community garden; Organic planting and harvesting; Supporting your local food pantry; The fruitful co-existence of church parish and community garden. Environmental Change-Makers is a nonprofit corporation (and applying for tax-exempt status). In order to continue to carry out its mission and projects, ECM receives its support from the general public. Speakers fees and donations to ECM are one of the ways ECM finances its operations. Speakers fees will vary depending upon which ECM speaker you are requesting, whether your organization is a nonprofit organization, how distant you are from Westchester, and what cash-free-economy exchange you might offer (example: connections which further our ongoing projects). For events outside the L.A. basin, we will request support for travel costs. 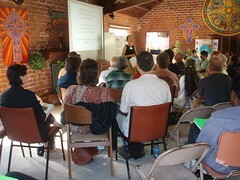 We offer either Powerpoint presentations or “low-tech” presentations. At most venues, we will request a table to give away ECM’s free handouts, which would be on a variety of “What We Can Do” subjects related to the general topic of your event. At events where it is appropriate, we may ask if we can sell ECM bookets and books. Please note that we do not participate in debate forums. We tend to decline proposals with less than 30 minutes presentation time, since these have not proved fruitful with respect to the preparation and travel time they demand.